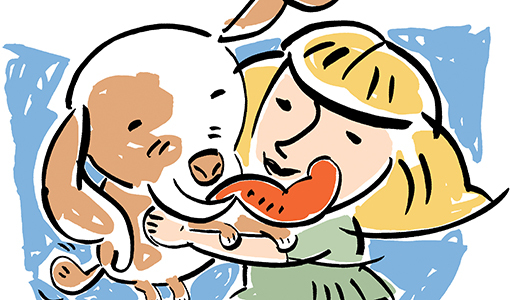 When your dog licks your face, is it kissing you, or does it mean something else? And perhaps more important, do you like it? Not all animal behaviorists would agree, but Stephanie Borns-Weil, V07, believes a dog that licks its owner is showing affection and a type of bonding behavior. Dogs don’t have lips like humans do, so they can’t make that smacking sound, she says. Licking is the next best thing. Dogs also lick to appease, says Borns-Weil, a clinical instructor in animal behavior at Cummings School. Puppies lick their mothers to get them to regurgitate meals, allowing the young animals to eat the already-chewed, partially digested food more easily. As adults, dogs may lick when they’re nervous—a kind of “don’t-hurt-me” strategy, she says. But she does understand that some people just don’t want to be dripping in dog drool. In that case, she says, it’s OK to train your dog not to lick by encouraging another behavior that’s incompatible with licking. For instance, when your dog starts to lick, you can ask it to sit and get petted. Then your pet will feel reassured instead of rebuffed. Adapted with permission from Your Dog: The Newsletter for Caring Dog Owners, published by Cummings School of Veterinary Medicine. For subscription information, go to tuftsyourdog.com or call 1.800.829.5116.